Synesthesia is the sensory-intellective phenomenon that concerns the onset of an auditory sensation, and/or visual, and/or olfactory in conjunction with a stimulation-perception of different sensory source, for example gustatory and/or tactile. The phenomenon whereby the stimulation of a sensory channel produces, besides the specific perception of the activated channel, even the perception of another or multiple sensory channels. Among all our senses there is a deep connection, proof of the extraordinary human capacity to feel and perceive a complex, as fathomless, but incredibly rich of nuances and inter-connections. This means that a solicitation perceived by a specific sensory organ, in the moment in which is recognised by the brain, can stimulate and turn on in our mind a sensory reflex concerning (afferent to) another sensory organ. For example, sounds and/or musical notes can evoke a colour, or recall a tactile sensation. A given perfume recalls a taste whose vibration evokes a specific auditory sensation, etc. This sensory/perceptual phenomenon, known by the term “synesthesia” (from the greek syn aisthànomai = I perceive together), indicates the "connection - co-vibration" between different senses when a perception takes place and is mentally elaborated. Synesthesias have been long studied in neuro-cognitive sciences, in Consumer Science (Sensory Analysis applied to the evaluation of the quality of existing products), are used by producers of various goods (especially for food products) to optimize their business performance. Each of us knows them and/or has had direct experience with them for their use in literature and poetry: they are imaginative and insightful expressions, that remind us that we are a unique articulated organism and that all our perceptive channels contribute together to determine our sensory, intellective and vital experiences. Synesthesia highlights a simultaneous poly-sensoriality of sensations that, for the first time, are ordered into a system and connected in the Sensorial and Synesthetic Wheel. Such work is the result of the intuition and ideation of Luca Maroni, of his thirty years of professional experience as sensory analyst and of the current global scientific knowledge on synesthesia. 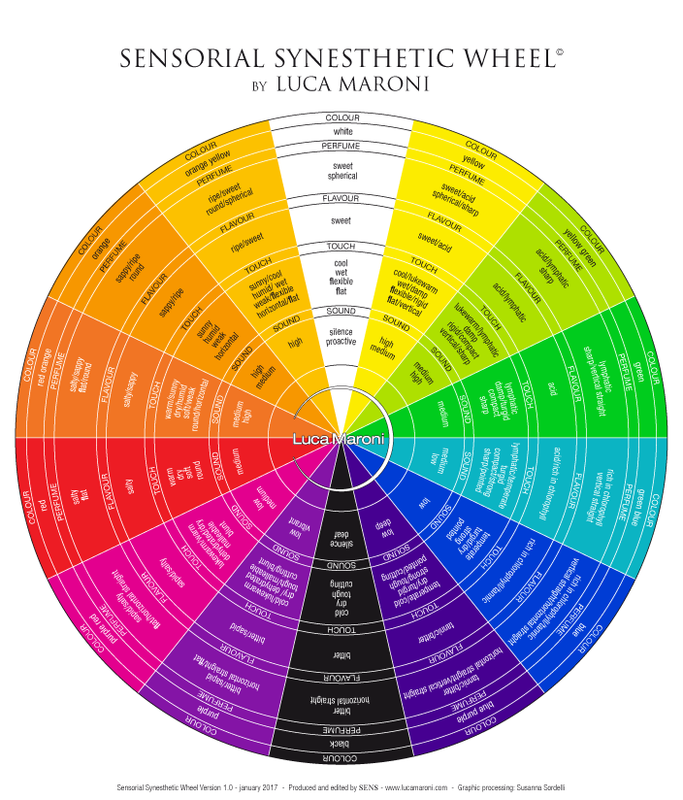 The Sensorial and Synesthetic Wheel by Luca Maroni is the first cognitive-representative model that identifies and codifies the relationship between a sensation perceived by a specific sense, and the detail of other sensations, perceived and/or perceptible at the same time-correspondingly by other senses. What is the relationship between all the sensations perceivable by humans? When my nose feels a certain perfume, my mouth a given flavour, what touch and sound, what colour has or would have that olfactory sensation? What is the universal interconnectivity between the various human veins of perception? ". The systems proposed up to now, involve, as in the case of wheels of colours or perfumes, only a few senses, and all of them exclude - for the sense of sight - the white and black colour. This is strange, since the black and white are not "exceptions" to our eyes, or unnoticed and unseen jokes in the colour spectrum: they are real colours with which we paint the walls or we dye the clothing. In this regard, the Sensorial and Synesthetic Wheel by Luca Maroni is the first systematic depiction of synesthetic relationships that exist in the human sensory spectrum: it highlights the essence of the perceptible by every sense organ, and it depicts the reflex that each sensory perception experienced by a certain sense causes in each of the others. Then it highlights the system of relations between the five senses and it represents a system of poly-sensoriality, rich of perceptive recalls in which everyone can identify with. The visual outcome of this study is a fascinating multicolour wheel: it evokes the multifaceted reverberation of the rainbows and it is not coincidence that it recalls the magic of the mandàla (from the sanskrit = circle), symbolic pictograms that in the eastern religious tradition represent the ineffable, holistic and hologrammatic richness of the cosmos. And it is precisely in this human sensory multidimensionality up to now not represented in a system that lies the genesis and significance of the research that Luca Maroni has made: the creation of a model which highlights and represents the way the different human senses are related and interconnected, and/or how all of them reverberate consequently and harmoniously, perceiving only one sense. Proprietà intellettuale riservata. Tutti i diritti riservati. - Copyright © 2017 SENS s.r.l. Descriptor: length of light waves. 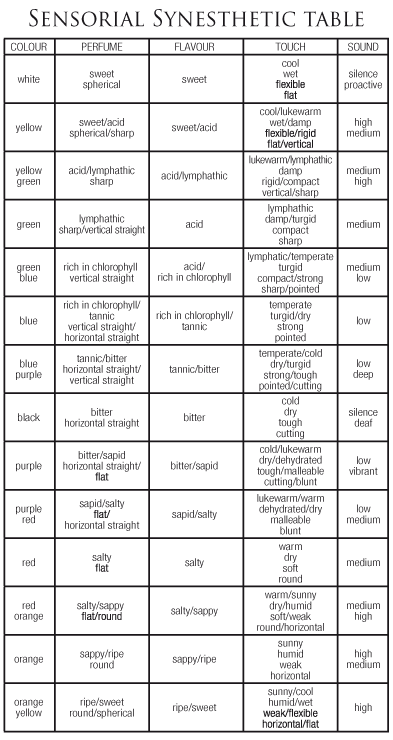 Descriptors: 4 basic gustatory sensations. Sensation: quality of contact with the skin. 1) temperature: cool, lukewarm, sappy, temperate, cold, warm, sunny. 2) hygrometry: wet, turgid, dehydrated, dry. 3) consistency: flexible, rigid, compact, strong, tough, malleable, soft, weak. 4) shape of the object of the contact: flat, vertical, sharp, pointed, cutting, blunt, hotizontal, round. Agent: aerial vibration of waves of change in pressure of a body. Descriptor: frequency of sound waves. Frequency of waves: high, medium, low.